Commercial Doors | Glenview Haus | Chicago. Custom Front Entry and Interior Doors, Custom Wine Cellars, Custom Cabinets. 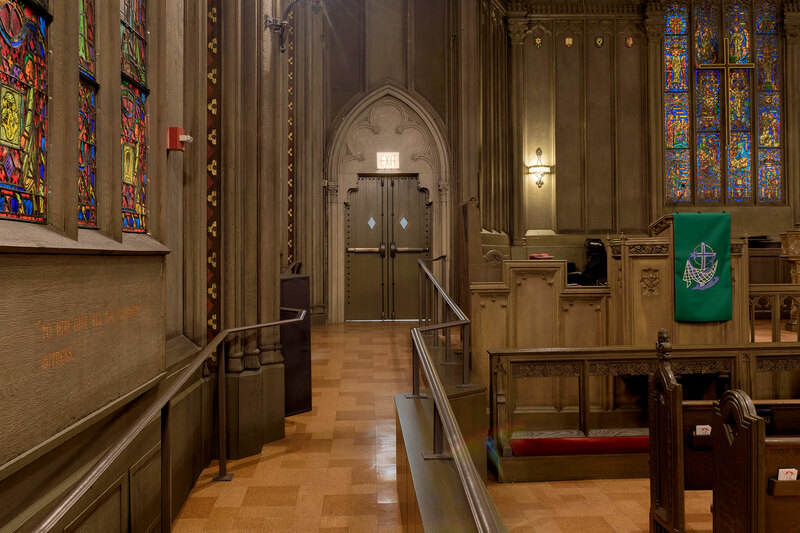 Located across from City Hall, the iconic and historic Chicago Temple Building at 77 West Washington is home to the First United Methodist Church. When this early high rise was built back in 1924, it was the tallest building in Chicago. This highly unique skyscraper church houses an expansive, 4-story chapel on the ground floor. The rest of the building is dedicated to office space. There is also a small chapel on the top floor at the base of the steeple. 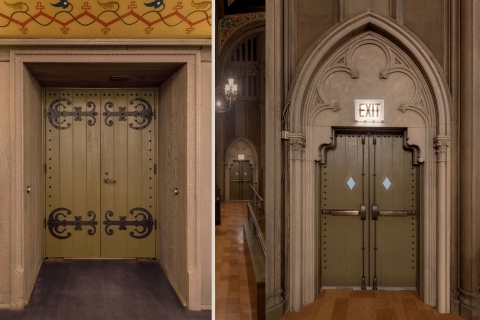 As part of the building’s recent renovation, the church needed to replace several doors for the ground floor chapel. The old ones were beautifully designed neo-gothic doors that perfectly fit the surrounding architecture of the church. But they didn’t meet modern fire code standards for commercial buildings. So, the general contractor in charge of the project reached out to Glenview Haus with the difficult job of building several new fire-rated doors that blended in with the surrounding architecture. Glenview Haus came through with something even better: new 90-minute fire rated doors that look exactly like the old ones. Glenview Haus is certified in a special technology that lets them make an endless range of custom fire rated doors. Whether it’s 20-minute, 60-minute, or 90-minute fire ratings, Glenview Haus uses this technology to create authentic fire rated historical replicas and historical renovation doors. For replicas and historical renovation doors, the idea is to create doors that look as close as possible to the original ones while using new technologies to improve their performance. The new doors can have better insulation and energy efficiency; use new, modern hardware; or abide by strict fire codes. The 77 W Washington project took advantage of all three improvements. Although the new doors are made to look old, they have better insulation, modern hinges, and a 90-minute fire rating. Their custom, handmade decorative hardware pieces look just like the original. 1834: A log cabin ws built just north of the Chicago River for this congregation. 1837: The cabin was moved to the corner of Clark and Washington Streets, which is also the location of the present building. 1845: A brick building was erected to replace the log cabin. 1858: A four-story building was built to replace the earlier brick structure. The church was on the upper two floors. 1871: The building was destroyed by the Great Chicago Fire. It was immediately rebuilt. 1922: Construction began on this building. 1924: This building was dedicated. At the time of its completion, this was the tallest building in Chicago. This building is faced with grey and white Bedford oolitic limestone from Indiana. The stained glass windows were created by the Giannini &amp; Hilgart Studios. The main altar in the first floor sanctuary was carved by Alois Lang in Oberammergau, Germany. It shows Jesus weeping over Jerusalem as he descends from the Mount of Olives. The altar in the sky chapel depicts Jesus looking over the skyline of Chicago. The sky chapel’s structural beams are in the shape of Saint Andrew’s crosses. The organ has 92 ranks with four manuals. 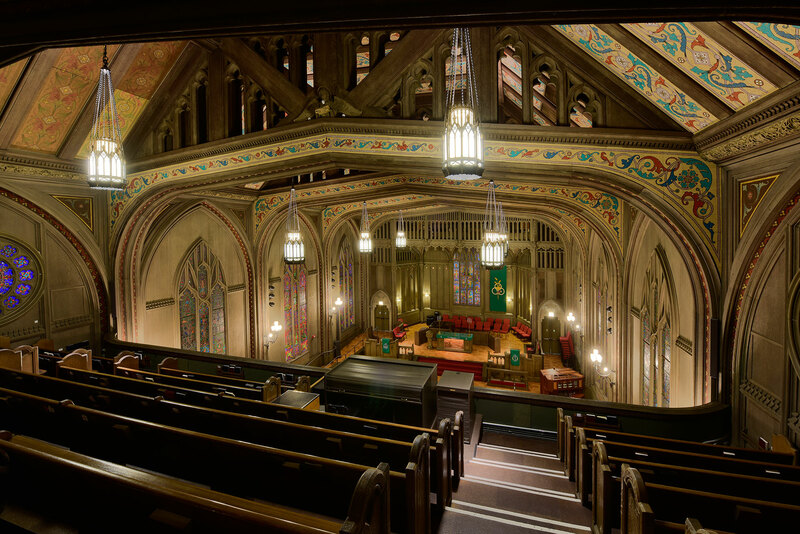 The sky chapel was a gift to the congregation from the Walgreen family of Walgreen’s drug stores. Glenview Haus recently renovated the entryways of an unusual collection of luxury townhouses at Ontario and State that really put their front doors to the test. Creating custom modern commercial doors for these units required both a designer’s eye and an engineer’s mind. The entries to these modern townhouses sit on the pool deck of a high-rise, 14 stories above street level. This lofty location and lack of entryway overhangs mean that the front doors endure heavy exposure to the elements. As a result, these wood front doors get more than their fair share of rain, snow, and especially wind. Not long after construction in 2003, the townhouses’ original solid wood front doors began showing serious signs of wear. Some residents began to replace their entry doors, and soon the six townhouses each had six different front doors. Even the newly-installed doors offered little insulation and soon began wearing, warping, and splitting. As beautiful as these modern luxury townhouses were, the mismatched, deteriorating front doors did them no favors. The homeowners’ association finally decided in 2017 to commission matching front doors consistent with the modern look of the townhouses. The real challenge? Finding design-driven custom modern commercial doors that could withstand the weather conditions for years to come. Glenview Haus came to the rescue with a beautiful modern custom door design, advanced European construction methods, and white glove service from measurement to installation. The new custom front doors each feature a flush mahogany panel with linear stainless steel inlays. The design now matches the building’s overall style and the other metal elements in the surrounding entry. In addition, Glenview Haus built the doors using a modern European engineering technique, ensuring they will look good for years. Solid wood stiles and rails surround a polycarbonate core, encased by a real wood veneer. As a result, the doors look exactly like solid wood doors but with greater stability, superior insulation, and enhanced resistance to extreme weather conditions.